When I first came across with the Death Note’s plot (as told by a friend) I thought it sounded very violent and so ‘off’. But when I finally read the whole manga series, I like it so much I find it hard to take a break in between. Now, I consider Death Note as one of the best manga and anime series that I’ve ever read and seen, along with the all time favorites, Rurouni Kenshin, Slam Dunk, Inuyasha, Naruto and many more! The anime is classified as shounen, in general, and a suspense thriller to be specific. The manga was written by Tsugumi Ohba and illustrated by Takeshi Obata and it spanned to 108 thrilling chapters. It was serialized by Shueisha in Weekly Shounen Jump. I finished downloading the complete scanlated manga series last semester, thanks to Toriyama World, Orange Tangerine, Shannaro, TOWNL (The Ones Who Never Lie), We The Fans, and Pedo Bears who took the painstaking job of scanning the raws, translating, typesetting, proofreading, editing, and doing the quality check job before they reached us fans. proofreaders: ndruo, seres, blue chaos, dits, nhongaeri, sneweee, the next generation; editors: william_h, lilink, riesig, alpha0me9a, ratti, liaison, madmane, chibura, rikku, kaiser-chan, chibi yuuto, lolimaster; raw providers: vilespawn, general smoker, asakura; quality checkers and staff members: iwanin, scout, occa, chris, murmel, yumi, rut, syon, rei, bluechaos, chikubi, leona, seres, fnuckale, GX, kumo, grungy_hamster, shaza, terramare, wasabi; scanner gto0o; and additional art provider devil ozma for making the scans available to the Death Notes fans out there. You rock guys! The 108 manga chapters was squeezed to 37 chapters of anime adaptation produced by MadHouse Studio, Nippon Television, Shueisha, D.N. Dream Partners and VAP. It was directed by Tetsurou Araki. It has been aired in Nippon Television (Japan), Bionix (Canada), Adult Swim (US), and Animax (Hong Kong, Taiwan, and other respective networks worldwide). 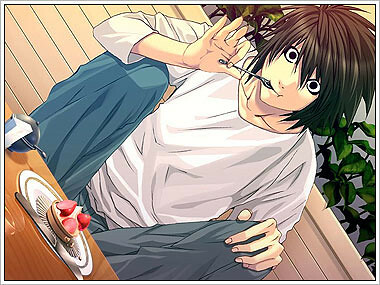 The story centers about Light Yagami (or Yagami Raito in some adaptations) who finds a supernatural notebook named as Death Note. At the back of the notebook are the rules on how to it, and one of them says that if you put a name of a person in the notebook, he or she will die. Light finds the notebook really stupid to start with. He begins to believe a little when he first glimpsed the death god Ryuuk, a Shinigami and who happens to be the owner of the note. Later on, he is immersed with his own idealogy to purify the world by writing the names of the evil people in the notebook and create the ideal Utopia – but to the extent of destroying himself in the end. Of course, lots of things happen in between: like meeting Light’s opponents L, Mello, Near, Light hooking up with Misa (another Kira) and Takada (messenger of Kira) to pursue his plans, meeting other Shinigamis and many many more! 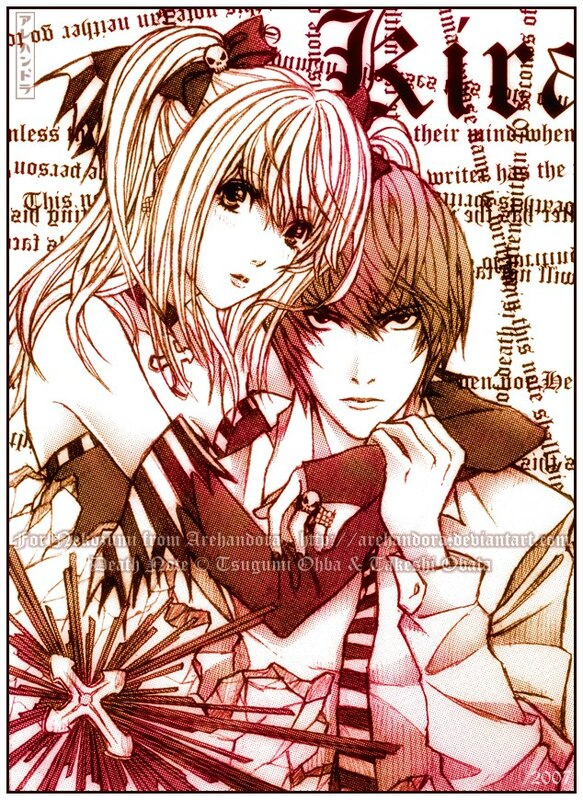 I love the Misa and Raito (Light Yagami) tandem. Somehow, it’s appealing. 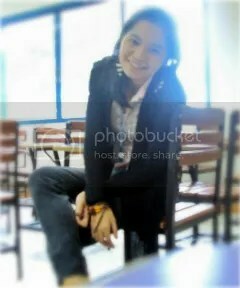 Hahahah. The Kira and the second Kira.